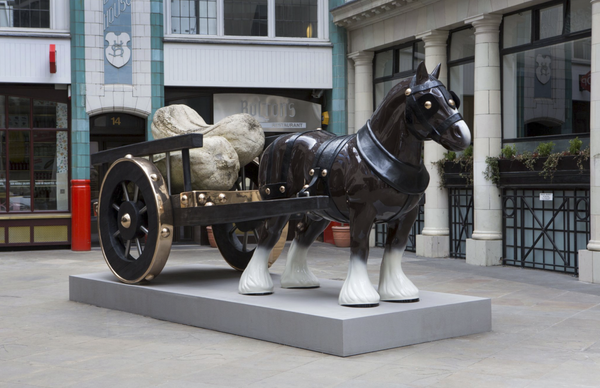 Sarah Lucas’ sculpture Perceval – a life-size bronze horse and cart – presents a large-scale replica of a traditional china ornament, of the kind that took pride of place on many British mantelpieces forty years ago. Scaled up, the Clydesdale horse is powerful and majestic while offering an unthreatening sense of pastoralism and stolid reliability. The proudly-fashioned cart houses two cast concrete marrows: off-scale symbols of phallic fertility.